I saw the #ReaderProblems Book Tag on What’s She Reading? a while back. Ashley invited anyone to join in on the fun. I thought I would since it’s a cool tag. Here it goes! 1) You have 20,000 books on your TBR. How in the world do you decide what to read next? Ugh. This is a hard one. I normally have books stacked up on my counter from the library and there are a ton on my Kindle, too. I try to read the library ones first so I can return them before there due. But sometimes I just pick the book I want to read the most or a Goodreads group I’m in is reading a book so I read that one. 2) You’re halfway through a book and you’re just not loving it. Do you quit or are you committed? Most of the time I keep reading. If it’s completely horrible or truly offensive, I may quit. 3) The end of the year is coming and you’re so close, but so far away on your Goodreads reading challenge. Do you try to catch up and how? To be honest, I set my challenge at a number of books I know I can read in a year. If I’m ahead of schedule, I’ll add more books. So, if I was behind I would probably try to read more or reduce the number to something more manageable. 4) The covers of a series you love do. not. match. How do you cope? Honestly, I don’t know if it would bother me. I might be confused by the change, but it wouldn’t distract me from the story. 5) Every one and their mother loves a book you really don’t like. Who do you bond with over shared feelings? Probably my friends that read or my sister. Most of the time, they haven’t read the book yet so they don’t have an opinion and will just listen to me rant. 6) You’re reading a book and you are about to start crying in public. How do you deal? I would probably put the book away until I got home. The closest thing that’s happened to me is when I cried during reading Bright Side by Kim Holden. I bawled in front of my husband and he thought I was completely nuts. He just patted me on the shoulder and laughed. 7) A sequel of a book you loved just came out, but you’ve forgotten a lot from the prior novel. Will you re-read the book? Probably not. I may read the last chapter or read an online summary. 8) You do not want anyone. ANYONE. borrowing your books. How do you politely tell people nope when they ask? I hate lending my books! I only lend them to people I trust will get them back to me. Luckily, most of my books are on Kindle now. If I can lend them on Kindle, I do. 9) Reading ADD. You’ve picked up and put down 5 books in the last month. How do you get over your reading slump? I will try a new author. Usually, I’ll go on Amazon and type in a book I love. I’ll check out the books that come up along with that book. Or I’ll Google a book’s name with book like… Or I’ll check out recommendations by friends on Goodreads. 10) There are so many new books coming out that you’re dying to read! How many do you actually buy? Usually, I’ll go onto the library’s website and try to request them first. If I can’t get them that way, I’ll buy them. 11) After you’ve bought the new books you can’t wait to get to, how long do they sit on your shelf before you get to them? It depends. Some I read right away. Others end up sitting for a long time. Do you have any other #ReaderProblem questions you want me to answer? Leave the questions in the comments. Thanks for reading. 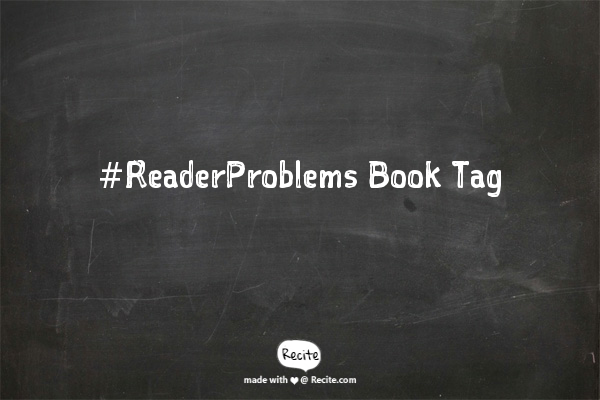 I invite anyone that’s interested to participate in the #ReaderProblems Book Tag. This entry was posted in Book Tag and tagged Book Tags by anovelglimpse. Bookmark the permalink.